Getty ImagesSeattle Seahawks players kneel and sit on the bench prior to an NFL match in November, 2017. Two Seattle Seahawks players were subjected to vile abuse outside the club’s training ground. A fan targeted Mike Tyson and Neiko Thorpe for taking part in the NFL kneeling movement, even though Tyson never actually kneeled. Video footage of the incident is below. A Seattle Seahawks player was subjected to vile fan abuse for kneeling during the US national anthem last season, even though he never actually kneeled. The incident occured while cornerbacks Mike Tyson and Nieko Thorpe were sitting in a car outside the club’s training facility in Renton, Washington. Neither Tyson or Thorpe appear unsettled at the abusive fan. In a video of the incident posted on Thorpe’s Twitter account on Monday, one of them can even be heard giggling. This might be because Tyson never featured for the Seahawks while the “take a knee” protests, which the fan is likely referring to, were taking place last season. Therefore, he never actually kneeled. However, this abuse was also incorrect, as NFL teams raise the bulk of their revenue from fans, sponsorship deals, and broadcasters. The take a knee movement began in 2017 when San Francisco 49ers quarterback Colin Kaepernick sat (and later kneeled) during the national anthem rather than standing and singing, as had been tradition. Kaepernick and 49ers teammate Eric Reid wanted to highlight racial inequality and police brutality in the US. The protest spread throughout the NFL with players from many teams eventually taking part. It eventually provoked a reaction from President Donald Trump who said NFL owners should fire players who kneel. Trump also encouraged fans to walk out from stadiums. 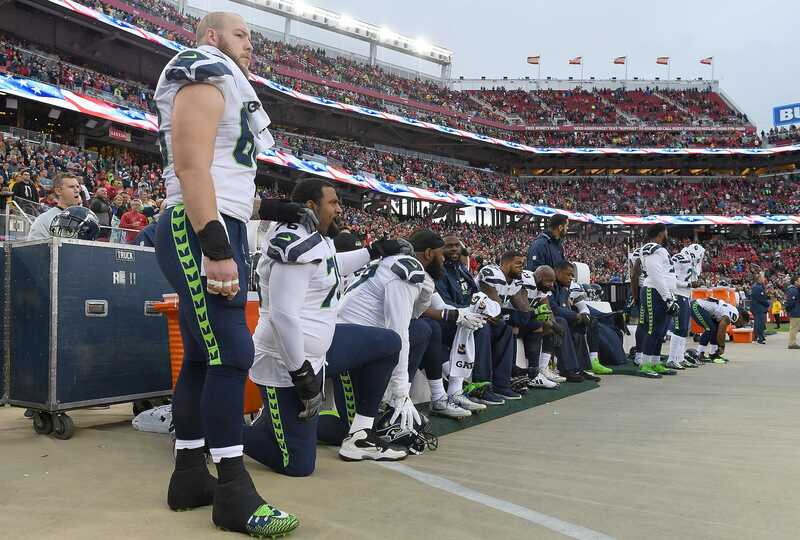 The Guardian reported that it is “unclear” whether Thorpe joined Seahawks stars like Sheldon Richardson or Michael Bennett when they kneeled during the anthem last season.